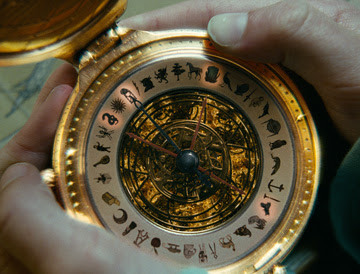 “The Golden Compass” represents cinema fantasy at its most striking and fearsome, underlining the genius of the modern moviemaker as technology grows and continues to allow him or her to test boundaries of realism without surrendering to obvious visual deceit. If only the screenwriters shared those ambitions. No, it’s not as if we as adults are the wrong target audience for a movie in which the hero is a young girl; au contraire, the source material, penned by the talented Phillip Pullman, is both brilliant and frightening in the way it allows dread to creep up on its young stars, forcing them to adopt adult roles in a story way too dark for innocent children to play in. A fully satisfying screen endeavor would sneer at the opportunity to dumb down Pullman’s narrative maturity in order to create broader appeal, but that alas is not the central mission in this venture. Absent from the film is the deeply political subtext of its foundation, the glaring void filled by ambitious special effects and colorful canvases meant to distract audiences from the notion that they are watching a story with its roots firmly planted in something much more tragic than those involved might be willing to admit. The hero is Lyra Belacqua (Dakota Blue Richards), a headstrong and independent orphan girl, just shy of puberty, who is always looking for new adventures and challenges to keep her amused. In this particular universe, a voice-over reminds us, human souls live not inside a person’s body, but rather right beside them, in the form of a shape-shifting animal better known as a person’s daemon familiar. Lyra’s daemon Pantalaimon comes in many forms – first a cat, then a mouse, then a moth, always shifting but never settling as a child’s identity continues to explore the world, refusing to come to rest on one perception until absolute comfort is reached, usually during the middle teen years. The approach offers intriguing contrasts and studies into a person’s psyche, and there’s a great scene involving Lyra and Pan being pulled apart that represents just how crucial the companion is to the story. The daemon represents their soul, yes, but also their heart, their conscience, their entire free will. They are inseparable beings. Lyra occupies a room in a tower of Jordan College, where she has been seemingly exiled to live out her young years, away from harm, by her stern and enigmatic uncle Lord Asriel (Daniel Craig). At the opening of the picture, he arrives at Jordan with evidence of a great phenomenon in the north, a series of slides that reveal, quite possibly, an alternate universe in the skies that may be reachable with further experiments. The idea greatly troubles the Magisterium, a group of authoritarian figures who are seemingly self-appointed keepers of the human race, who work long and hard hours in order to keep people “in balance” and away from alternate ways of thinking. Asriel’s discovery, of course, contradicts the teachings of their ways, and when he is granted further funding by the college board, they dispatch a cunning and secretive woman named Mrs. Coulter (Nicole Kidman) into the life of little Lyra, who sees her uncle’s discoveries as something to boast about and may be willing to share that stuff with someone she grows to trust. Ah, but to assume that Miss Belacqua is easily persuaded would undermine the point of the story, which is that a child carries much weight on his or her shoulders when it comes to the balance of the world. Before being entranced, lured and charmed by Mrs. Coulter into leaving Jordan to become the beautiful woman’s assistant, the master of the college gives her a golden compass and tells her to never reveal it to anyone. Called an alethiometer, it is a large and complex piece of machinery that, we are told, “tells the truth.” On its face, three hands point to various symbols, meant to frame a question in the mind of the person who controls it. The fourth hand, which spins much like that of a regular compass, reveals the answer when the question has been concentrated on long enough. The technique, we find out later, is a difficult one to master and requires many years of textbook education to fully comprehend, but Lyra is significant in the sense that she is able to read, understand and interpret its messages instinctively. The Magisterium suspects such a gift might be dangerous in the hands of one who knows how to do it, and will stop at nothing to ensure that the aleithiometer is destroyed once it has been found. There is a sense of wonder and excitement that engulfs the presentation of these conflicts. Visually, New Line Cinema has found a story that finally matches their “Lord of the Rings” trilogy in its stylistic stimulation, and the special effects wizards leave viewers near-breathless in their treatment of the story’s many distinguishing details, such as red zeppelins that transport the wealthiest of England between two points, and witches who glide through night skies not with broomsticks, but with elm branches that they utilize as weapons. The highlight of their work is an armored bear named Iorek Byrnison (voiced by Ian McKellen), who has been created with such painstaking attention to detail that there is never a moment in the movie when we consciously think about the illusion. He is simply a piece of the fabric, a notion that intensifies our appreciation for a cinematic effect that grows more convincing day after day with the evolution of technology. But how about that story, eh? Oh, what a sad and gloomy day it is to see Pullman’s literary work diluted through the naïve perception of filmmakers who strive for nothing more than passable narrative yarn. “The Golden Compass” plays too innocent with its premise, seldom allows its characters to gain dimension, and all but ignores the looming instinct of the plot to abandon its innocence and begin discovering the dark little secrets of the writer’s complex world. These are not going to be issues brought to the table for a viewer going in without prior knowledge of the source, naturally, and perhaps this is a movie made intently for them. For the rest of us, it’s almost unforgivable. Such is the thought in our heads by the time the movie makes the effort to move into its last act, altering specific sequences of events for no other purpose than to confuse, and unleashing an ending that feels so incomplete and crushing that it leaves most staring on in disbelief. No one is ever bothered by a happy ending, but in the case of a film that is desperately in search of at least one clue to the menace and despair that saturates the trilogy from here on out, it is misleading, pompous and generally self-defeating. Oh, to see the look on the faces of casual moviegoers had the picture been brave enough to reveal its root intentions right there in the finale!